Sorry to trouble you, but would you please be kind enough to help me? A group of EPS members purchased some Trachycarpus princeps from a nursery in Thailand and I managed to buy two from one of them. They have been in the UK about two months and I understand that there has already been some growth and new roots produced on some of the others. I decided to re-pot mine yesterday and was disappointed to find there were hardly any original roots and no sign of any new ones being produced. Both plants still look green and have not gone crispy or died back in the three weeks I have had them. I am keeping them in my greenhouse and placing them outside on hot sunny days. I keep the compost damp and spray them frequently. One of the EPS members who says that his has grown placed a plastic bag over the plant and kept it on a south facing window. Unfortunately I do not have a window that faces in this direction. I am desperate to give the plants the best possible chance of survival, especially as they cost me a lot of money. I was wondering if any of the following would help: Spraying the leaves/fronds with a foliage feed. Dipping the roots in rooting powder. Placing a plastic bag over each plant and sealing them in. Leaving the plants in the greenhouse as long as it does not get too hot in there and avoid the sun scorching them. Placing the plants outside in a warm sunny spot when the weather is good. Have you any other thoughts please? Don't panic!! My first plants were collected in the wild as small seedlings, about 15mm across at the base with three or four small leaves in poor condition. I had five such plants. None of them did ANYTHING for about three months. And I mean anything. Then they started to move, first one, then a second, then all of them except one. I kept them humid but not excessively so and as they grew they speeded up. The biggest, which I planted out in the greenhouse in the ground, is now a good two feet tall with several big leaves, all displaying the bright white/silver backs. Those still in pots are slower, and one just died for no reason. Two of the others began to lean over dramatically actually exposing the base of the trunk. One of these we have re-potted in an attempt to correct the situation. Four of the five seeds I had about two years ago germinated. These are also growing very fast and the very first split leaves are white backed. The one recalcitrant plant from the first batch still has not moved but it has not deteriorated either. There is still a chance. SO, my advice: Keep the soil moist at all times, but not wet. You could use some hormone rooting powder, but don't disturb the roots. Don't re-pot the plant/s. Keep the plants in bright but indirect light. Do what you can to increase the humidity, but don't overdo it. They definitely respond to warmth. Maybe you should invest in a propagator, or perhaps you have an old aquarium lying around. This would be GREAT! Stand it on end if not tall enough, and close it with a sheet of glass. This will enable you to control the humidity. I think the plastic bag may be too stifling, and may encourage rot. These plants do not grow in humid rainforests remember, but in the open. Finally, be patient and don't to anything drastic, like feed, re-pot, over water, or put outside in the sun. The plants have had a major shock and like humans they simply need time to recover. Best of luck, M. G.
The remarkable Juania growing in David Robinsons Garden near Dublin, Ireland. Juania does seem to be an enigmatic plant. I have had some contact with Rene Coativy from Bormes les Mimosas in S France. He had over 100 palms in his garden but would not plant a Juania because he 'knows' that it wouldn't survive with him! My plant is looking very well and has never had any attention such as watering or feeding; I do keep the weeds away from its base. Do you know of any growing outdoors in England? Rene says that there are none in Europe. It seemed to me as a palm novice that the biggest problem is getting reliable information. Information on what? Well, information like . . .
- What can be expected to grow well in my garden? - What microclimate should I provide? - How to do the feeding and watering? - How fast can I expect my plants to grow? - How large can I expect them to grow? 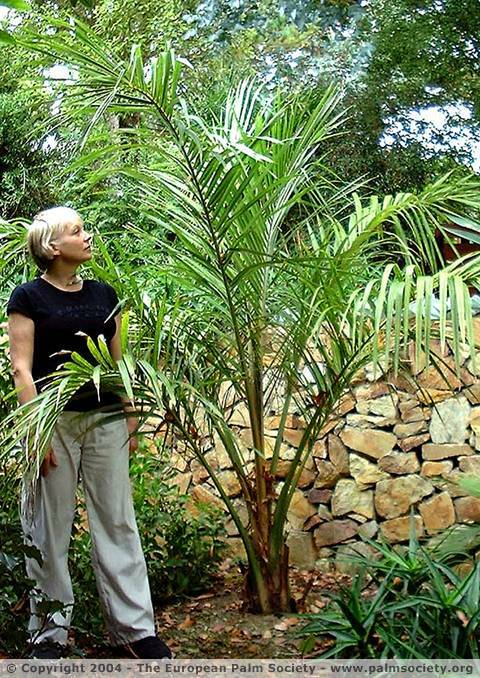 The rarepalmseeds website has excellent background information on a wide variety of palms, with customers supplying their own experiences on germination. Could we do this at the EPS website for palm growing experiences? This could provide useful information for magazine articles. This could also be developed into a database: Palm growing experiences by country & postcode. If we all measured our palms every year on a date at the end of the season we'd really get an idea of what grows best where. As I said, these are the thoughts of a complete newcomer . . . What do you all think? I think this is an excellent idea. If, for instance, a group in the forum can figure out how they would like this to be set up, we could install something on the website fairly easily. T. S.
As a new member of the EPS, I was thrilled to receive journal No 47 with the photo on the front cover taken from Paradiso, Lugano. Italian Switzerland-- Ticino--The Swiss canton my wife and I fell in love with some years ago and have returned to time and again. In fact, on reflection, it is the ambience and magnificence of these particular T. Fortunei that convinced me I should like to try and cultivate one. I am now pleased to be doing so, although I fear it shall be a long time, if ever, that mine reaches the splendour of any one of these fine specimens. Within minutes of receiving journal 47 in the mail, I found I was comparing the photo on the front cover with one of my wife and I taken at this exact spot, during one of our visits in the early 90s. Was there anything significant about the nature of the T. Fortunei, from both photos, that would be of interest? Wait a minute! On our photo, Monte Bre is sweeping down to the lakeshores on the opposite side! The T. Fortunei appear to have switched positions on either side of the footway!!! Then I realised that the photo on the front of journal 47 appears to have been printed in reverse, as can be seen from the name on the hull of the lake steamer, which from left to right would read "Morcote", a delightful village located on a peninsula down the coast from Lugano. Anyway, enough of this nit picking! Right way round, back to front or otherwise, it makes little difference, since these majestic T. Fortunei make this enchanting spot, what it truly is--Paradiso. Reigh Sneddon, Perth, Scotland, U.K. Your observation is correct. While it is not common practice to touch up the cover photos, we did reverse that particular one so the nicer palms would be on the front cover and the boat would drive towards the front, not out of it. I refer to your editorial in Issue 47 of Chamaerops regarding the promotion of EPS. When it was difficult to obtain and cultivate palms in our cool temperate climate, then it was necessary to share information with others of a like mind who wished to succeed in growing palms and learn from the success or failure of others. 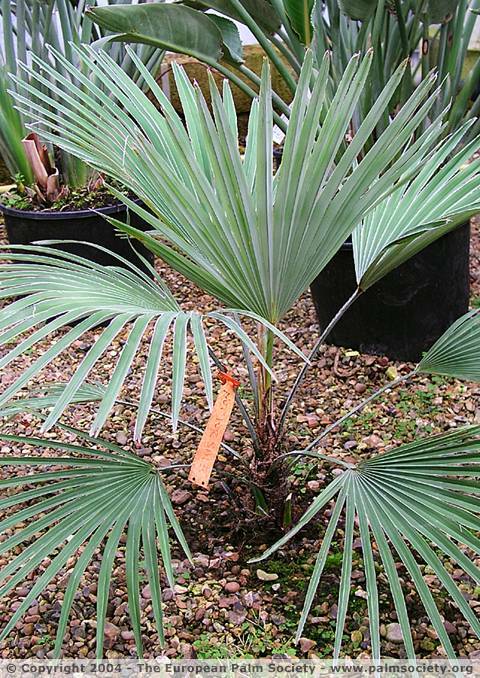 Now, as you rightly observe, palms can be found in most local garden centres and DIY outlets, and many of the specimens are sold as hardy. If they are hardy, then the average gardener will have less need for information and, as a result, EPS is unlikely to recruit many new members. Whilst palms are our main interest, I am sure that many EPS members are interested in exotics in general, as articles in Chamaerops will testify. When I started growing Trachys they were very much a novelty; but now, every year, I see those darling little seedlings growing around the base of my female Trachy, just like those palm trees growing on the Spanish Costas, and one of the main reasons why I wanted to grow palms. Some fifteen years down the line, I own my first two juvenile hardy citrus trees and these are not generally available via normal citrus nurseries in the UK. Therefore, I am at about the same position as I was at the beginning of my interest in palms, and I have to search the Internet around the world for information on how to grow citrus normally and obtain any information that I can find about growing them in a Northern European climate. In addition to Palms and Citrus, my other interests include Agave, Aloe, bamboos, bananas, cacti (Opuntia), Hibiscus, Bougainvillea, Italian cypress, olives and pomegranates. I would like to grow Pinus roxburghii, that wonderful Indian screw pine of which there is a fine specimen in the Temperate House at the RBG Kew. Alas, I have had little success in finding information about this on the web, let alone finding viable seedlings for sale. I am of the opinion that whilst the main thrust of EPS should be with palms, we should embrace other exotics to share our knowledge and ideas about how to cultivate them, at a larger level than we do currently. Something like The European Palm Society for people with an interest in palms and other exotics, or The European Palm and Exotics Society. This will broaden the base of EPS and give it extra appeal to potential members prior to any promotional campaigns. Hello, heres some additional data on the Darjeeling Banana, Musa sikkimensis. It does take cold as well as heat. Here in the USA zone 7B, Mississippi, I started one in 2002 and it got about 10 feet (3 m) tall the first season. I intentionally left it unprotected to see if it indeed took cold. Our coldest temperature was 9�F (-13�C) with a good dozen or more nights into the teens. I thought it was a goner but the banana woke up the first week in May and never missed a step, going to 16 feet (5 m) tall with a near 18-inch (46 cm) trunk base in 2003 before the first frost of 22�F (-5�C) in late November sent it into dormancy. The traditional Mississippi summer heat did not phase it a bit. It did not flower but thats OK with me. The foliage, which is so palm tree-like, is what I like. So many of our visitors this year were just amazed by the plant and so am I. Its still hard to imagine a banana that takes cold. This winter the bananas trunk is encased by a chicken wire cage filled with leaves and pine straw. Your readers will be delighted with this banana. It is a winner! Could you please cancel my membership to the palm society, as I have found the first year very disappointing. The members area on the web site has a lower attendance than Wimbledon FC and the society magazines are rarer than the Dodo. Could you please confirm my cancellation by return? Thank you, Nigel Lacey. Like the vast majority of small, specialist societies it is really only the members such as yourself who can keep things going, and this has and I suppose always will be an issue. Commercial magazines that cater to the 'exotic plant' market have come and gone so I guess the numbers of interested gardeners in this area is not enough to sustain a commercial magazine either? You mention the members area is largely deserted; why didn't you contribute to it during your year of membership? (Sincere apologies if you did and I missed the posting, but I don't recall seeing anything). I tried hard to get more people out of the membership to add something, even if now and again as I appreciate not everyone wants to post daily, but it seems the majority sit in the shadows!